Air Conditioning Repair Eastlake: Is Your AC Ready for Summer? Now that the winter is starting to fade, everyone is looking forward to the warmer seasons. 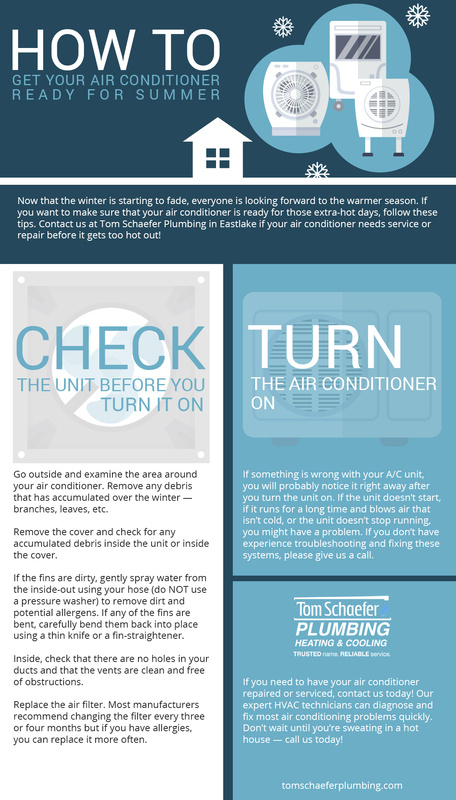 If you want to make sure that your air conditioner is ready for those extra-hot days, follow these tips. Contact us at Tom Schaefer Plumbing in Eastlake if your air conditioner needs service or repair before it gets too hot out! Our HVAC service and repair experts are ready to help your air conditioner get into fighting shape. The sooner you contact us to schedule an appointment, the less likely you will have to suffer from any sweaty days inside your home! 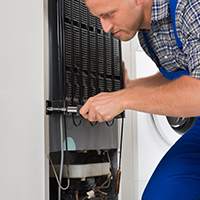 Getting your AC unit ready before you start to use it is incredibly important. What might have been a small concern can turn into a big problem if you run the system while a component is damaged or broken. If you aren’t sure about your air conditioner or any of its associated parts, give us a call. We are more than happy to provide an inspection of your AC system. If you’re comfortable getting your system ready, check out the tips below. Go outside and examine the area around your air conditioner. Remove any debris that has accumulated over the winter — branches, leaves, etc. Remove the cover and check for any accumulated debris inside the unit or inside the cover and remove anything that you find. If the fins are dirty, gently spray water from the inside-out using your hose (do NOT use a pressure washer) to remove dirt and potential allergens. A pressure washer can bend your fins! If any of the fins are bent, carefully bend them back into place using a thin knife or a fin-straightener. Inside of your home, check that there are no holes in your ducts and that the vents are clean and free of obstructions. If your vents are dirty or obstructed, it can force your unit to work harder than it has to without actually cooling your home. Replace the air filter. Most manufacturers recommend changing the filter every three or four months but if you have allergies, you can replace it more often. If something is wrong with your A/C unit, you will probably notice it as soon as you turn the unit on. If the unit doesn’t start, if it runs for a long time and blows air that isn’t cold, or the unit doesn’t stop running, you might have a problem. If you don’t have experience troubleshooting and fixing these systems, please give us a call. If you need to have your air conditioner repaired or serviced, contact us today! 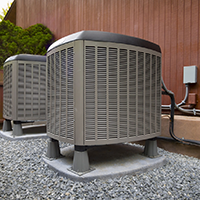 Our expert HVAC technicians can diagnose and fix most air conditioning problems quickly. Don’t wait until you’re sweating in a hot house — call us today! We have proudly served the Eastlake area for years, and we guarantee that if you hire us, you will be happy with the services that we provide. 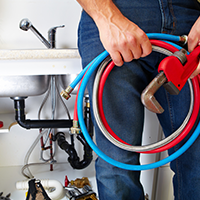 At Tom Schaefer, we also provide expert plumbing services and repairs.